Thanissara trained was a monastic in the Ajahn Chah Forest Tradition for 12 years. 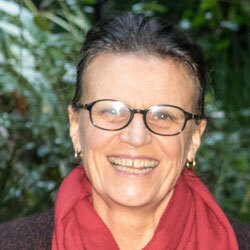 She’s led retreats since 1988, and co-founded Dharmagiri in South Africa and Sacred Mountain Sangha based in California. She has an MA in Mindfulness-Based Psychotherapy from the UK, and is author of several books, including Time to Stand Up: An Engaged Buddhist Manifesto for Our Earth — The Buddha’s Life and Message through Feminine Eyes.